What is personal finance? Simply put, it is a way of living that will help you become debt free and not only survive difficult times, but thrive. The frugal life means learning to live simply, and rediscovering the wealth of the humble existence. It's re-evaluating your life, and realizing what the bare essentials truly are. It includes both budgeting your money, and learning to manage your time as well. It means taking stock of your life, and learning to eliminate the unimportant things. Ever wondered why diet plans don't work? For most people, dieting means starving yourself until you reach your desired goal. Then once you're there (or at least close to being there), you go back to your old ways of eating. Then the weight piles back on. Not only that, but you now probably weigh a little more than before. So it is with your money. Depriving yourself financially may work for a little while, but in the end you'll be right back where you started from - or worse. Far better to look at frugal living as a way of life. 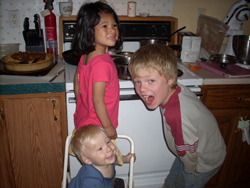 A frugal way of life enabled us to adopt our three children debt free. My husband and I have lived on a single income since soon after our marriage in 1992. My husband has worked primarily as a carpenter. Our income has always been small. Some would consider what we live on to be shockingly meager. And yet, in the last sixteen years, we have become completely debt free. We have no mortgage and no car payments. In addition, we have adopted three children without going into debt. One adoption cost us more than thirty thousand dollars. We have always had money in the bank, and currently, we have enough food in our home to live on for the next year. Unlike the large majority of people in the United States and throughout the world, we have never lived from paycheck to paycheck. We do things ourselves as often as possible to save money. We continually practice frugal living. I have learned to raise part of our food through organic gardening and I've learned to put up the produce we've raised through methods such as canning, freezing and dehydrating. We've learned to ban fast food from our lives and to eat whole, complete foods that truly provide nutrition. We have become self-reliant, learning to make it ourselves instead of running to the store or mall. We realized that by getting rid of the clutter in our lives, we can have a wealth of both space and time. And finally, we are learning to practice generosity. We believe that when we bless others, God blesses us in return. 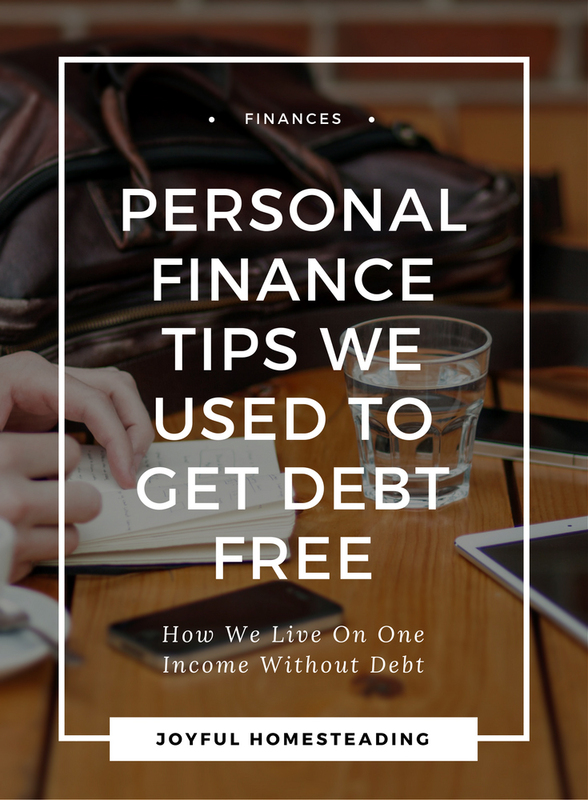 We have learned that what is personal finance is a part of who we are. We now live on five acres with our three children. We have kept goats, pigs, turkeys and a whole bunch of chickens. We are learning to live the self-reliant life. We buy in bulk when things are on sale. We're learning the value of staying put, right at home instead of spending all our time in the car. We make things ourselves and save a ton of money. You can do it too. Stick with me, and we'll make it work together. Ready to be free of debt for the rest of your life? Learn how. Learn the tricks of living Debt free. The self-sufficient life is a busy one with everything that needs to be done, so learn to make the most of your time. Here's how. Living without a spending plan is a bit like taking a trip without getting directions. Learn more. Learn the importance of cutting back on expenses. Ready to get more done in less time? More time saving tips. Don't stop at a burger joint to save time, instead, set up your crock pot in the morning and come home to a savory meal. Here are a few recipes. Less is more when it comes to junk in your home. Here's why. The best way to save is through simple living. Learn more. Think you're poor? Please read this article. Saving money can be fun when you get creative. Here are some fun ways. The most effective ways to save money are also often some of the easiest. Learn more. Worried about the economy? Not only can you survive a depression, but thrive as well. Here's how. Taking charge of your finances is one of the most important things you can do. Here's why. It's during the hot summer months that we all tend to use more electricity for keeping our homes cool, putting a strain on the power grid and our budget. 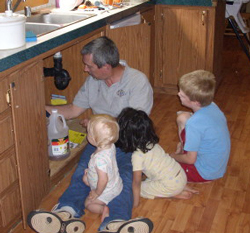 Learn how you can cut down on energy costs by clicking here. Learning to cook from scratch is a great way to cut down on grocery costs, but the increased health benefits are even more valuable. Learn more. Do you have a favorite way to save money or a tip you think could help others? Share them here.